As a warrior, do I need Regal Captains Gloves? And in which gear set do they belong to? TL;DR: You do not need them. If you get them and want to use them, they have a place in low accuracy sets, provided your accuracy is in the 60%-20% hit rate. Above 60 they do nothing at all. Under 60% hit rate they can be very good as they basically let you keep using your storetp/multiattack set without having to swap any other piece for accuracy. Requires knowing in advance what your hit rate will be tho, and since the special effect is tiered, you want to arrange things so your hit rate is at the high end of the tier. A very niche pieces, all things considered... not needed by any stretch. The only thing they're good for is finding an NM's evasion. Nice, thank you. The JP link is perfect. It seems to have all the newer type mob families listed, which is exactly what I was looking for. I assume Zan = Slash, Strike = Pierce, Far = Blunt and Rippled = uhh 2nd type of blunt? There are two types of blunt, though, H2H for whatever reason is a different blunt type than clubs or staves. Surprised they didn't have a separate H2H category, but I guess that doesn't matter on very many things (Caturae shields aside, I think just magic pots?). Is that list accurate? It says Yakshi piercing = +0% but I recall it takes less piercing dmg. I think it's fairly accurate but there's probably some mistakes and some of it is incomplete. I'd be inclined to agree that Yakshi probably has the same damage resistances as Wopket (-95% piercing) but I haven't tested it. It lists the dynamis wave 1 and 2 statue levels for sandy and some of the stats for the high tier Leviathan fights. It also has player avatars I think? Doesn't seem to list Teles as piercing weak either? I thought she was. Which cape are we using for Ukko's Fury these days? I seem to have a 10% Crit one but i'm using WSD which was probably due to the WSD bug. I looked back in this thread and Saeval mentioned a DA cape over Crit, at least for when blood rage is up possibly? Right now i use a full on turtle set taken from my pld. I was thinking sulevias but the haste drop is harsh any ideas? Head is a DM Aug. I should probably ditch Loricate for the +2 necks HP+ and DD stats and make up that DT elsewhere. Ambu Cape with PDT-10 or DT-5 depending on where you are at cap. High hp, but i like it. why is Niqmaddu is used in tp set when we can use maybe 6tp ring? That’s almost my exact set and I love it. The key to all that is Retaliation, god I love retaliation. Warrior tanks by smashing it's face into the monsters fist until the monsters fist breaks. anyone know if these have to be worn for the duration of retaliation to have the affect or is it worn on activation ? Need to be worn. They add dmg when retaliating. Anyone know of a parser that can detect retaliations other then kparser? 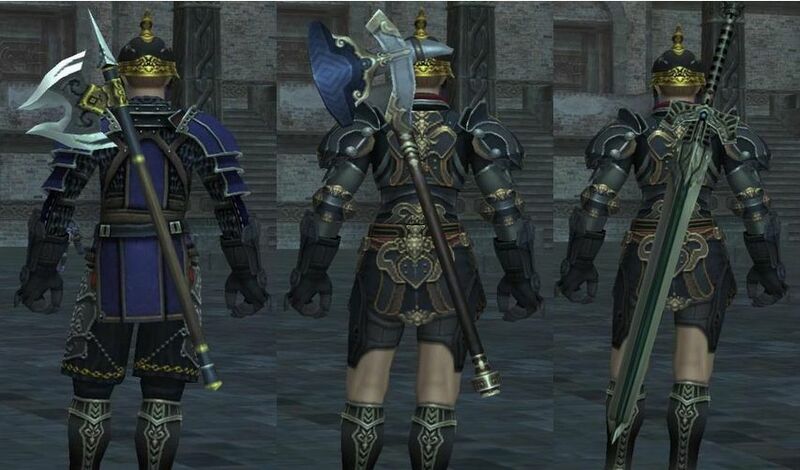 After all these years we still don't have solid data on retaliation proc rates and I'd like to get some for Great Axe, Dual Wield, and One Handed delays. The Parthenon is an ancient temple built by the Greeks, in Athens, to tribute their maiden Goddess, Athena. Athena is the goddess of wisdom, courage, law and justice, just warfare and strength. Kyklos is a term used by some classical Greek authors to describe what they saw as the political cycle. In this guide, I hope that all Warriors can come together in one place and discuss our never ending cycle. From starting the job for the very first time or discussing the most optimal gear choices, all culminating in an effort to improve ourselves and others. Over the years I’ve developed a unique passion for Warrior. Its raw damage, its utility in almost every situation, and the mastery required to truly excel at it. 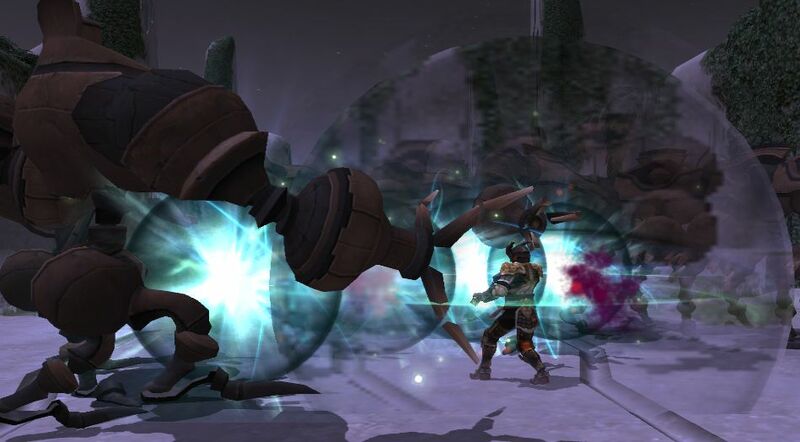 I get a lot of PMs of people asking about Warrior, so in this guide I hope to spill my brain of what I’ve experienced and learned so far playing Warrior throughout my FFXI career. If the only thing on you mind is pure DD, as I’m sure this is the case 90% of the time, then Warrior is certainly right up your alley. Warrior commands an impressive arsenal of Job Abilities, Weapons, Weapon Skills, and gear to make the job excel in almost any DD situation you put it in. It doesn’t stop there, though. Warrior’s utility extends beyond just DD. Having access to an astounding amount of weapon skills primes it for being one of the best procing jobs for both Abyssea and Voidwatch. Most useful of all is Warrior’s access to 10 out of 13 ‘red weakness’ weapon skills with Samurai as sub job, and 13/13 being possible if you have the proper merits, gear and sub job. 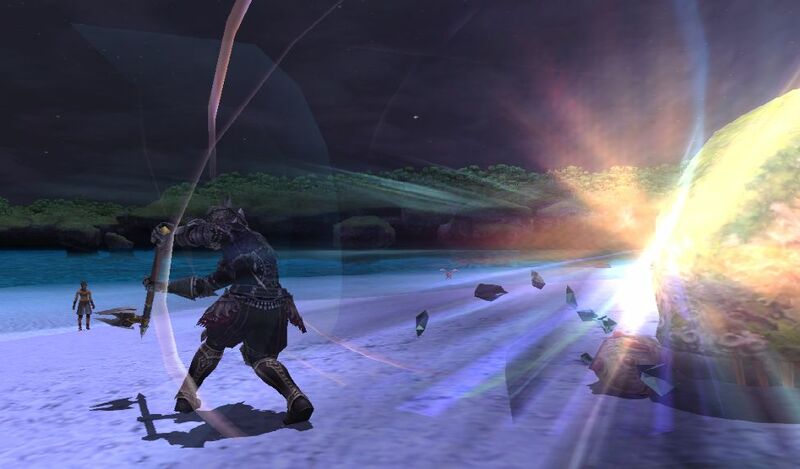 Beyond that, warrior excels at killing many enemies at the same time, or “cleaving” which has become the popular term because the name of the weapon skill used is called Fell Cleave. of everyone melee in the party with Warcry, Blood Rage and Tomahawk. Warrior has many, many abilities, all of which serve a purpose depending on the situation. The addition of Job Points and Gifts have further strengthened these already strong abilities and traits. Mighty Strikes: Level 1. 45 Second Duration. 1 Hour Recast. 45 Minute recast with 2100 Job Points. The Holy Grail to all that’s Warrior. This ability allows all attacks to deal critical damage, even during WS. When used at the right time, with the right buffs, this ability will often allow you to deal unprecedented amounts of damage for the duration. Can be extended to 60 second duration with Augmented Relic Hands. Provoke: Level 5. 30 Second Recast. This ability increases your Volatile enmity by 1800. It is useful for claiming, getting hate at the start of a fight, or pulling hate off job you don’t want to have hate. Berserk and Aggressor: Level 15 and 45. 3 Minute Duration. 5 Minute Recast. Berserk increases your attack by 25% at the penalty of lowering your defense by 25%. In an update, Berserk now scales in potency with your level, giving Warrior a total of 35% attack at level 90. This is a very useful ability, as attack is a key component in how much damage you can do, which has become increasingly important in content like Dynamis Divergence Wave 3, where Frailty's potency is significantly decreased. The ultimate enhancement to this ability is Conqueror’s ‘Augment Berserk’, which increases the attack gained to 33.5% and raises your critical hit rate by 14%. Aggressor increases your accuracy by 25, but lowers your evasion as a penalty. Berserk's duration can be extended to 3min 48second duration with Agoge Calligae +3 and Pummeler's lorica +3 when equiped for activation. Recast can be lowered as low as 4 minute 10 seconds with merits. Job Points increase Berserk attack by 2 attack per JP for a total of +40 attack. 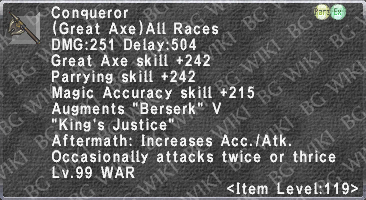 Merit options: Although Aggressor was once very useful when accuracy was a major issue, I’d recommend 5/5 Berserk merits at this stage of the game. Warcry and Savagery: Level 35 and 75. 30 Second Duration. 5 Minute Recast. Raises the attack of the party members around you, but its best use comes from the augment on Agoge mask +3, which raises TP bonus by up to 70 for everyone in the party that are in range depending on Savagery merits. The best thing to remember about this ability is that it overwrites and can be overwritten by Blood Rage, so always make sure to talk to any other Warriors in your party about a planned order. Duration can be extended up to 60 seconds with [https://www.bg-wiki.com/bg/Agoge_Mask_%2B1]Agoge mask +1[/url] when equipped for activation. Merit options: 5/5 Savagery is a major boon when zerging things with Mighty Strikes with weapon skills that damage varies by TP. Easily the largest DPS Job ability for WAR outside of SPs. Retaliation: Level 60. 3 Minute Duration. 3 Minute Recast. Retaliation allows you to count an enemy’s attack with your own, but instead of negating the damage like Monk’s Counterstance, Retaliation gives you TP for the price of taking damage. This ability is useful when you’re one of a few DDs attacking an enemy, allowing you to build TP even faster than you normally would. The main drawback of this ability is the reduction of your movement speed, which can be annoying if you’re running around a lot. Warrior's Charge: Level 75.1 Minute Duration(or next attack). 5 Minute Recast. Doubles or triples your next attack. Triple attack rate increases by 5% per merit after the first for a total of 20% with 5/5. Augment on War. Cuisses +2 also raises crit. hit rate by 1% per merit. While nice for those absurdly high WS numbers, sometimes it’s not even worth using due to the JA delay costing you more DPS than you’d gain, since in some situations your DA will be so high, DA procing from WC don’t really mean much. Merit options: Not too amazing anymore outside of Epeen WS #s, but 5/5 Tomahawk is very situational also. Ideally you can keep merits in Warrior's Charge then swap it to Tomahawk when a fight calls for it. Tomahawk: Level 75. 30 Second Duration. 3 Minute Recast. Mostly useless, but the times you need it, you’ll be very happy you have it. Duration can be extended up to 1 minute 30 seconds with merits. Decreases a monster’s weapon resistance by 25% and up to 30% with augment on War. Calligae +2 and maximum merits. Merit options: Like mentioned before, with how easy it is to cap merits nowadays, consider meriting this when you come to a fight that needs it. Restraint: Level 77. 5 Minute Duration. 10 Minute Recast. Restraint increases your WS damage with each hit you land. The amount of WS damage increased from Restraint is doubled when wearing Ravager's mufflers +2. Blood Rage: Level 87. 30 Second Duration. 5 Minute Recast. Increases critical hit rate by 20% to anyone in your party within 13.9 radius around you. Extremely powerful for weapon skills that can crit, but also provides a substantial boost to melee damage. It can be very beneficial to make an order for this ability if you have more than one Warrior in your party to maximize its effectiveness. Duration can be extended to 60 seconds when equiping Rvg. Lorica +2 for activation. Warrior has access to many types of weapons, but I’ll just cover to most acceptable 2-handed weapon choices. Ragnarok comes in first for Mighty Strikes zerging. The +accuracy allows it to make up for Warrior’s lack of skill for Great Sword and even exceed Conq/Ukon’s total accuracy potential. Acceptable to be used in highly buffed zergs. • MS Resolution is amazing. • Fulltime crit. hit rate +14%. • Can be used by 2 other jobs, mainly DRK, which is also a DD powerhouse. • Low delay makes it hard to x-hit. • ODD only procs on the first hit. • Terrible relic WS makes Aftermath not worth using. The ultimate weapon choice for when you're utilizing skillchains. A multiple step skillchain ending with Radiance can be extremely potent if your party setup allows for it. King's Justice > Steel Cyclone > Upheaval > King's Justice > Upheaval will end with Light>Radiance. 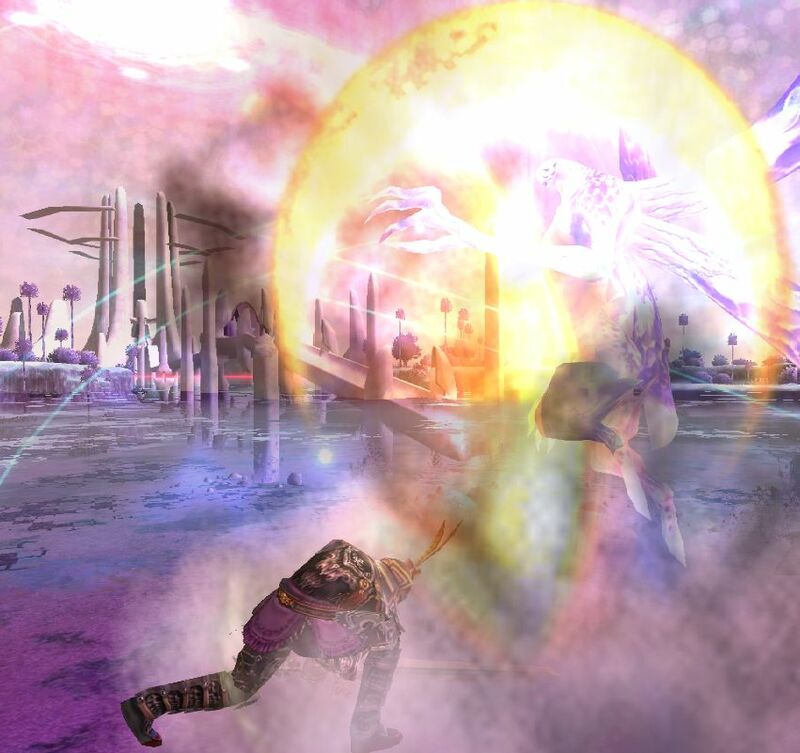 Chango itself gives Upheaval the unique ability to make Light with itself, which it otherwise can't do with other weapons. • 10 STP and 500 TP bonus. • Allows your Upheaval -> Upheaval to make Light. 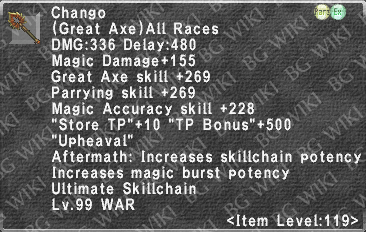 • All great axe weapon skills are kinda meh currently, so, overall, in a zerg situation with other DDS, it'll probably fall behind. • Hardest ultimate to get if you don't have an Aeonic group. Compared to Conqueror, Ukonvasara’s much easier to obtain. Aftermath is extremely potent with this weapon, doing triple damage 50% of the time with AM3, which equates to 4-6K crits fairly often. Only falls behind Ragnarok because of Great Axe's poor weaponskill choices. • Easier to obtain than other ultimate weapons in terms of effort/reward ratio. • Blood Rage is perfect for Ukko’s. • ODD can proc on all hits of an attack round. • Relies heavily on outside buffers, mainly COR, and other Warriors for buffs. 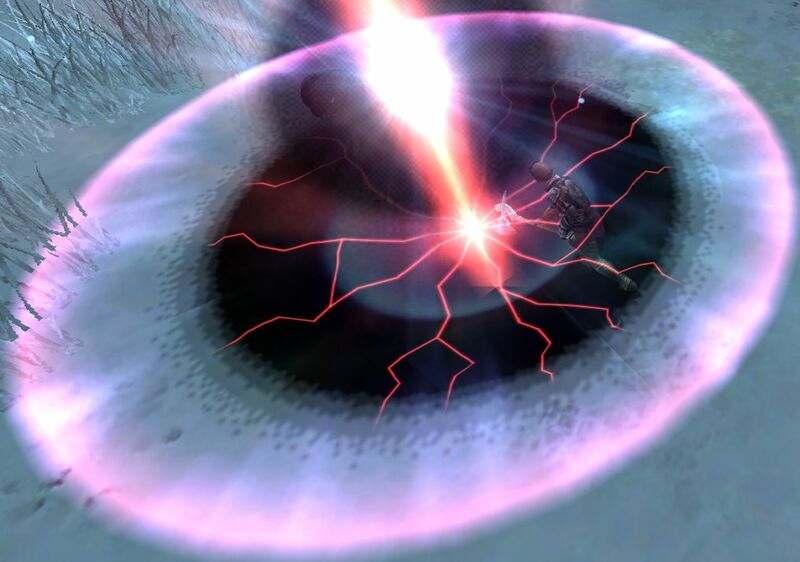 • SE has recently taken a liking to adding monsters with crit. def. bonus. • ODD doesn't proc on WS. • Has been known to make people forget they have any other WS besides Ukko’s Fury. The ultimate trophy weapon for Warrior. The attack and crit. boost to Berserk is very potent. Currently, Conqueror as at the bottom of the list of RMEA, only really excelling in situations you'll be making multi-step skillchains. • AM3, which is 40% DA and 20% TA, drastically increases TP gain, melee damage, and WS damage(can proc on 1st hit on any physical WS). • Augments Berserk V increases berserk’s attack to 33.5% and adds 14% crit. hit rate. • King’s Justice isn’t too terrible of a WS to trigger AM3 with. • Warrior’s high DA rate diminishes Conq’s AM3 effect. • Berserk can be dispelled. • Maintaining AM3 isn’t always easy. Any mistake, such as poor WS timing, not building 300% TP at the right time, or having to stand around for long periods of time can drastically reduce your DPS. Although behind all the other ultimate weapons in terms of pure DPS potential, Bravura’s niche is survivability while maintaining decent DPS. • -DT Aftermath that allows you to use optimized hybrid builds. • Additional Effect: Evasion Down lasts for about 40 seconds. • Assuming they ever fix Metatron's additional effect, -18.75% defense down that lasts for up to 2 minutes. • Lowest DPS potential of the Ultimate Weapons. • Hybrid builds are still possible for other weapons and usually a straight up –DT build used at the right time is going to be more beneficial. Obtained as a drop from NMs in Rala Alluvion Skirmish or by trading 3 Mellidopt Wings- obtained from Yorcia Alluvion Skirmish, to the ??? near the Augural Conveyor. Can be augmented by Divainy-Gamainy in the Inventors' coaliton. Duskslit for additional base damage. Snowslit for Accuracy and Attack. Leafslit for DA and STP. To see the full list of possible augments check out BGwiki. •Relativity easier to obtain than a 119 RME. •Highest base damage Great Sword in the game. •High cost to obtain perfect augments. Obtained from Yumcax's Wildskeeper Reive, this Great Axe is second only to Razorfury. Solid choice for those who want a free option to hold them over until better GAs are released. •Can be augmented with Occ. Attacks Twice. •If you don't get this from the Quest, obtaining this could become a real pain if you're unlucky. Resolution: 5 Hit. 100% STR Mod with 5/5 merits. Damage varies with TP. Very powerful and consistent. When paired with Ragnarok and Mighty Strikes, arguably the best epeen weapon in the game. Becomes extremely useful when mobs have crit. def. bonus and very high evasion. Element gorget and belt are especially powerful, as their bonus carries over to all hits of the WS. Ukko's Fury: 2 Hit. 60% STR Mod. Crit. Hit Varies With TP(20%/35%/55% for 100/200/300%). Buffed and geared properly, Ukko’s Fury has the highest potential of damage out of all of Warrior’s WS(outside of Mighty Strikes). Aside from being very powerful on its own, Ukko's also has amazing WS properties, in that it can self light skillchain with itself and can also make light with Upheaval. Upheaval: 4 Hit. 100% VIT Mod with 5/5 merits. Damage Varies With TP. Opens up options for weapons that can’t use Ukko’s Fury. Very consistent damage, but the VIT mod kills its true potential. Powerful WS for mobs with crit. defense bonuses. Best WS to use when under the effect of Mighty Strikes if you don't have a Ragnarok. Metatron Torment: 1 Hit. 60% STR Mod. Aftermath: Damage Taken -20%. Mainly used for its aftermath. Sadly the defense down almost never sticks on anything that matters. Fell Cleave: 60% STR Mod. AoE Damage. Radius Varies With TP. An amazingly useful WS. Can be used to kill many, many monsters in a very short period of time for faster drops or XP. 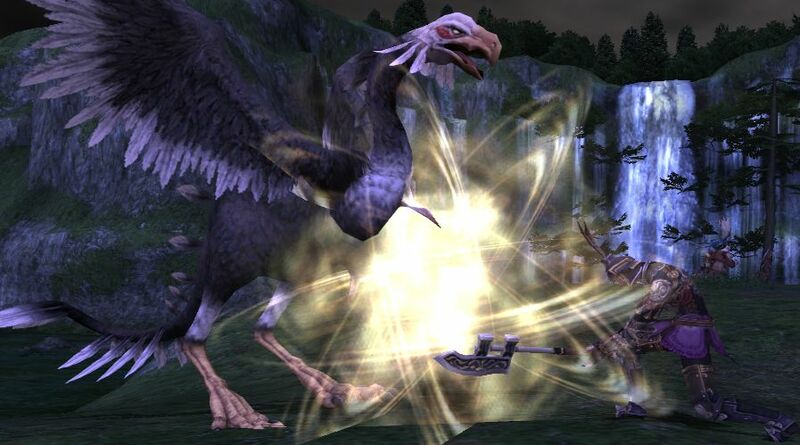 Can also hit flying enemies such as Arimaspi if you cleave a monster that's close enough to hit both. Raging Rush: 3 Hit. 35% STR Mod. Chance To Crit. Varies With TP. Good abyssea WS if you’re working on +2 gear/Ukon. But due to its low STR mod and fTP, it will easily be outclassed by Ukko’s in abyssea and Upheaval outside of abyssea.